Little do most people know that even with some of the most popular Internet browsers, you likely have your own profile setup by the people who distribute those browsers. 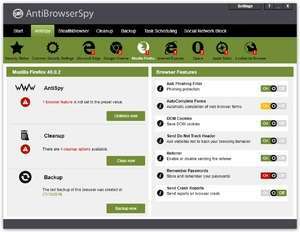 AntiBrowserSpy is an anti-spyware application which helps protect your privacy by removing traces of your Internet history as it attempts to hinder the collection of your browser habits, usually done in the name of quality control. AntiBrowserSpy can automatically turn off the collection of personal information and hinders the collection of personal information and browsing habits. It can also remove all traces of browsing history, which means the cache and temporary Internet files folders will be completely wiped. AntiBrowserSpy 5.0.0 is a shareware program and can be used as a demo to try the software until the free trial period has ended. A full version of the program is available after the trial period ends. For security reasons, you should also check out the AntiBrowserSpy download at LO4D.com which includes virus and malware tests. Additional screenshots of this application download may be available, too.